Fictional characters crossing over to either team up or do battle is nothing new. It happens in comic books all the time, and can be seen in movies like Frankenstein Meets The Wolf Man, King Kong vs. Godzilla, and Freddy vs. Jason. While many are intended to be one-time-only ideas, one crossover has become a full-fledged media enterprise. Following the first publication of Dark Horse's "Alien vs. Predator" comics in November 1989, the clash between the two extraterrestrial beasts went on to spawn novels and numerous video games, along with its own comic spinoff featuring another cinematic killing machine from the '80s, "Alien vs. Predator vs. The Terminator." After New Line Cinema scored big business with the release of Freddy vs. Jason in 2003, Twentieth Century Fox unleashed its murderous monsters onto the big screen the following year. There was much rejoicing in the fanboy community, but Fox ultimately decided to anger those fanboys by hiring relatively unpopular director Paul W.S. Anderson and released it with an unimaginable PG-13 rating. But does it manage to be good as its R-rated predecessors, or is it just a great big letdown? That's what we're here to find out. Our story takes place in Antarctica, where a satellite owned by the Weyland Corporation has discovered an unusual heat signature on Bouvet Island, a remote island off the coast of Antarctica. Upon further investigation, the Corporation discovers what appears to be an immense ancient pyramid buried two thousand feet beneath the island's surface. The pyramid apparently has characteristics of Egyptian, Aztec, and Cambodian pyramids, which is pretty amazing considering that it predates each of those civilizations. But the thing is, they never really make a credible attempt to explain the how's or why's of it. If you're not going to explain it, why bother even bringing it up in the first place? Weyland and Stafford inform the team at a briefing that the expedition will be getting underway as soon as possible, but Alexa objects. Turns out that the team will need at least three weeks of training because they don't exactly have the proper survival skills to survive the kind of environment they'll be up against. Yeah, essentially calling the crew a bunch of pansies is a really nice way to endear yourselves to everybody. Weyland informs Alexa that time is a luxury not afforded to them, so she quits. So what does Weyland do? He threatens to hire her closest competition if she doesn't accompany them on their fantastic voyage. A harsh businessman, Weyland is. Alexa knows that nobody can do the job as well as her and really isn't in the mood to lose out to a rival, so she reluctantly rejoins the team as they set sail. The team arrives at an abandoned whaling station and prepare to drill down into the pyramid, but they soon learn that a passage has been neatly carved out at a perfect 30-degree angle. The passage wasn't there the day before and nothing on Earth could have carved it that quickly, but nobody in the team questions it. The team ventures down the tunnel and enter the pyramid, but a few rash decision on their parts unleash the bloodthirsty Aliens from their crypt in the pyramid's basement. And to make matters worse, the scientists are also intercepted by three interstellar hunters we know as the Predators. Thanks to Sebastian's skill at reading hieroglyphics, we learn that the pyramid is a hunting ground for Predators, where they bred Aliens every hundred years so young Predators could engage in a ritual rite of passage. And just their luck, the humans are the bait. The squadron of Aliens soon wipes out pretty much everyone, leaving only Alexa and one Predator (Ian Whyte) to band together and fight there way to safety. Show the monster swinging a sharp object. Show the victim anticipating the death blow (and screaming, if the victim is human). Simple as that. Oddly enough, the movie is rated PG-13 for violence, language, horror images, slime, and gore. Slime?! If the MPAA can give a movie a PG-13 rating for slime, then I'm surprised Ghostbusters 2 didn't get an R. That movie is about slime. Just add that to the list of things that made absolutely no sense at all in this movie. Speaking of confusing things, we don't see the Aliens and Predators onscreen together until 53 minutes into the movie. When you see a movie called Alien vs. Predator, you expect to see monsters fighting each other, not occasional monster fighting interspersed with a bunch of worthless cannon fodder people walking around like a bunch of morons. I can understand wanting a human element in the film, but it shouldn't be at the expense of the title characters. The two species of extraterrestrial killers do square off, yes, but by the time they get around to fighting, the poor direction and paper-thin characters will have probably bored you to death. Seriously, what kind of idiot thought it was a good idea to give the quite inconsequential research team more screen time than the Aliens and Predators combined? Oh yeah, I know who that idiot is: writer and director Paul W.S. Anderson. Anderson's screenplay is ungodly bad, immediately evidenced by the fact that the movie was set on Earth circa October 2004. That's about as lazy as Anakin Skywalker living on Tatooine in The Phantom Menace. Why not just set it in space in the year 3000, or something like that? The movie just plods along, not really bothering to explain what's going on at any given time. How do the little Chestburster Alien guys grow so fast, when it took days in the previous four Alien movies? I guess the Predators had the Alien Queen hopped up on steroids in order to speed up their hunt, but since they never say one way or the other, all I can do is make assumptions. It's one thing for a movie to make the audience think about it, but it's another to force the audience to guess what's happening at any given time. Sometimes even the brightest viewer needs to have things spelled out for the movie to make any sense. And then there's the "surprise" coda that was so expected, it wasn't even a surprise at all. I'll admit that it was cool, yes, but it could be seen coming from a mile away. And am I the only one who noticed a few large jumps in logic? Take, for example, the scene in which we are introduced to Sanaa Latham's character. She's hanging from the side of a cliff on a clear day with nobody and nothing around, yet is surprised when she discovers a helicopter at the top. I may be jumping to conclusions here, but wouldn't she have, you know, heard it flying overhead? I could understand if she was so focused on scaling the cliff that she didn't notice, but how do you not notice a helicopter landing right above you? They aren't exactly a stealthy type of transportation. Another bizarre moment sees Latham's character telling everyone that the first rule of business was that everyone should stick together. So what does everyone do? They split up and go off by themselves. And then Latham goes off by herself to yell at everyone for going off by themselves. The insanity of the movie's screenplay culminates in a scene where we learn about the ancient civilization that populated the pyramid getting decimated by one of the Predator wrist-mounted nuclear bombs. If the entire civilization was wiped out, how could they write hieroglyphics about it? Were they doing it from beyond the grave? And what was with the pyramid walls intermittently moving around? There's no real rhyme or reason to anything. The whole movie is a vicious cycle of stupidity. And let's not forget about Anderson's trite, hackneyed direction. With Alien vs. Predator, Anderson appears to have no grasp on what made the first two Alien movies and the first Predator so enthralling. The movie suffers from uneven pacing and lighting that's too dark to really get a grasp on what we're seeing. Alien vs. Predator also suffers from the same problem plaguing many action movies nowadays: lightning fast editing and shaky camera work. During many of the one-on-one fight scenes involving the Aliens and Predators, the camera is all over the place and each cut lasts only a few seconds. What ever happened to the good old days, where filmmakers would just film a fight scene from two or three angles and let that be that? While I have no doubt that Anderson can make a movie that is visually stimulating, he seems to forget all the important stuff like story, decent scripting, good characters, good actors, that sort of thing. He is very much a director that favors style over substance, and while a "style over substance" type of film can be good in the hands of a competent director (e.g. John McTiernan's work on the original Predator), Anderson has yet to prove himself as either a credible writer or director. I don't hate Anderson with the same vitriol of others online, and I do think he has a good movie in him somewhere, but he needs to realize that just because you make a movie with style doesn't mean you've made a good movie. I also found the cast to be a tad lackluster. It seems like almost every character has an overstated foreign accent, but the funny part is their accents are all real. With the exceptions of Sanaa Latham and Lance Henriksen, just about everyone in the main cast is from Europe. The cast reads like a who's who of European countries; England, Scotland, France, Italy, Denmark, and the Czech Republic are all represented. Maybe the movie's very British director wanted a cast full of Europeans because he didn't want to feel lonely, I don't know. I don't have anything against Europe, but hearing almost every character speak with an accent threw me off. But in any event, Sanaa Latham has nothing resembling the screen presence or strength as Sigourney Weaver would have. Latham has all the charisma of a brick wall, and for the majority of the movie, she's an annoying harpy that just bogs the movie down. There's absolutely no reasoning given to make we the viewer want to see her survive. The rest of the cast is nothing but fluff and filler, with only Lance Henriksen being of note because he rules no matter what project he's working on. Meanwhile, the musical score composed by Harold Kloser is just like the cast: unremarkable. It was just too generic to make any sort of mark on the movie, and it never truly stood out in any way. 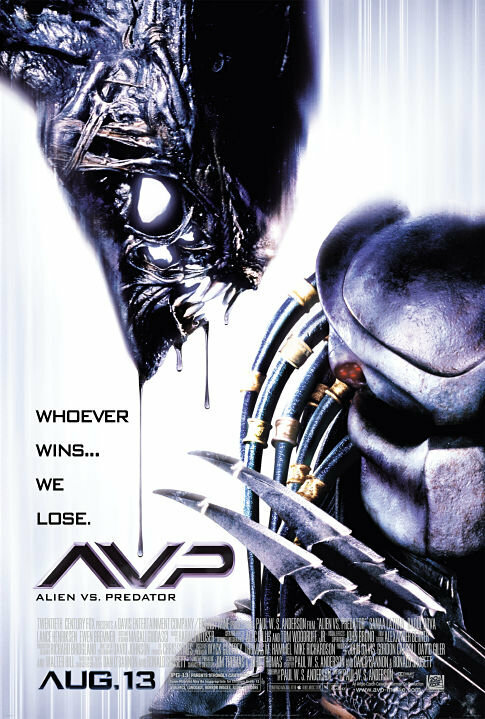 The movie's tagline is "whoever wins, we lose," and I don't believe they could have picked one that was any more fitting. Alien Vs. Predator is stupendously bad, a disappointment on the grandest scale. It's one thing to not live up to Predator and the first two Alien movies, because those three movies are classics no matter how you slice it. But when your movie makes people pine for Predator 2 and Alien: Resurrection, you may want to rethink your career. I honestly can't justify giving Alien vs. Predator anything higher than two stars. It's a sad, depressing waste of potential, and it's a shame that it couldn't even achieve mediocre status as a film.